The field of geography is split into two camps: critical scholars, who are skeptical of data because they believe it silences certain voices within society and fails to explain process and context, and empirical scholars, who incorporate data to create empirical models that explain geographic concepts and trends. Leif Brottem, Assistant Professor of Political Science with a PhD in Geography, is a firm believer in the importance of both critical and empirical approaches. Data analysis can compensate for and expand upon the limits of text and qualitative evidence. His focus on data analysis as a tool that illustrates narrative is evident in the work of each of his three classes, Introduction to Global Development Studies (GDS), Introduction to Geographical Analysis and Cartography, and Climate Change, Development, and Environment. In his Introduction to Global Development Studies, for instance, Brottem utilizes infographics & charts to explain basic concepts, and utilizes data tools such as GapMinder to illustrate change over time and regional differences pertaining to a variety of development indicators. His students also complete two data analysis exercises as a part of the class: one exercise asks students to study the relationship between economic development and social development indicators, and the second has students explore different aspects of population dynamics such as carrying capacity, limits to growth and the determinants of population growth. 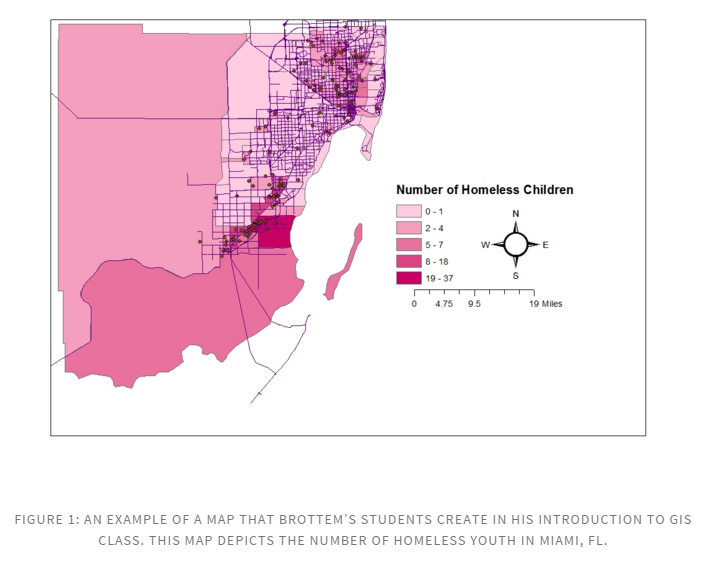 In Brottem’s Introduction to Geographical Analysis and Cartography course, students learn both the basic critical perspectives on how to evaluate maps and understand their overt and covert messages and practical techniques for making maps using Geographical Information Systems software. Students complete in-class exercises and take-home labs that require creating data and using data to solve problems. Finally, in Climate Change, Development, and Environment, Brottem utilizes data analysis in the form of topic-modeling: students investigate textual trends in various sources, from tweets to scholarly articles, using the MALLET topic model package. In addition, his students also work with Nvivo to conduct further qualitative analysis, and GIS to visualize spatial trends. Working with data builds data literacy, a marketable and necessary skill in the real world that Brottem says isn’t typically developed in a liberal arts settings. Building data literacy is especially important in his introductory classes, because he has students who wouldn’t otherwise be exposed to data, and aims to get them comfortable with using data and reduce their fears of data, numbers, and data analysis. Brottem strongly believes that data is a powerful explanatory tool that helps students think of different ways to look at the world and their studies, beyond theory.